Kennels are flexible and can be arbitrarily set to the length next to each other. They are easily assembled and transportable (for example on a larger trailer). The high quality of all parts surface guarantees high weather resistance. Metal is a zinc-coated and the wood is dual impregnated with clear organic coating. The walls are crosslinked or overlay, and because of the design they are freely changeable, or used as boundary walls, depending on the customer’s intent. Crosslinked wall with doors or without doors is made of a steel profile 25 x 25 x 2 mm welded mesh panels with a mesh size of 100 x 50 x 4 mm with the reinforcements that ensure the strength of the wall. The wall also consists of overlay of profiled steel panels from planks 19mm thick. The roof of the kennel is made of alu-zinc trapese sheet of standard length 2.3 meters (can be longer). Wave height is 20 mm. Seaming front and side planks are adapted for roof pitch. Roof slope at 2.3 m is about 150 mm, optional front or back. It is accompanied by self-tapping screws fitted with rubberised underlay. The height of the kennel is 1, 8 m.
The floor is made of wooden flooring from 25 mm thick planks connected with 50 mm hight bars. 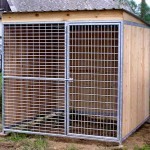 For every kennel is given the relevant hardware and fasteners needed to build the kennel. 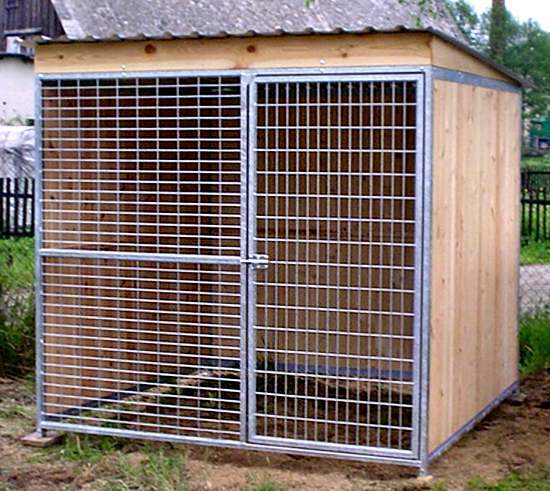 The kennel is suitable to be built on a hard flat terrain! 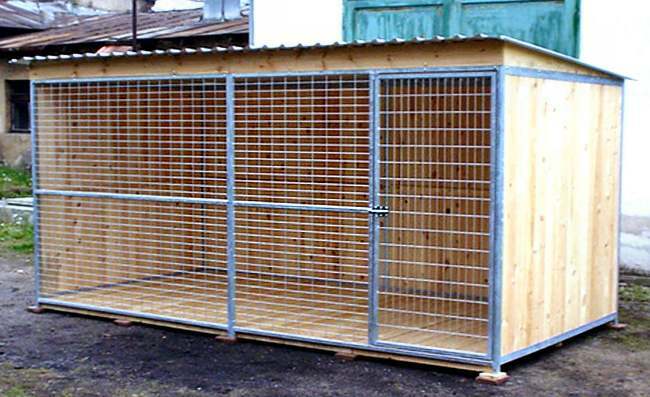 Stabling triple – box is suitable for training ground and is available of this dimension: length = 2.2 m, depth = 1.2 m, height = 0.85 m. It is dismontable with removable dividers. 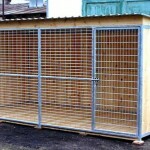 The price “with UNI” means the price for the specific kennel with all-wooden UNI plus-box (2 x 2 m).